Part 1 Fundamental resources, design, safety and reliability: Meteorology and wind resource assessment; Site investigation, characterisation and assessment; Aeroelasticity and structural dynamics; Wind turbine wakes and wind farm aerodynamics; Fatigue loading. Part 2 Wind energy system materials and developments: Aerodynamic design of rotors; Drive train systems; Control systems; Tower design, erection and maintenance. Part 3 Operation and maintenance (O&M), performance assessment, and optimisation: Reliability and maintainability, and O&M strategies; Condition monitoring systems; Performance assessment and knowledge management; Optimising design for in low wind speed operation; Optimising design for cold climate operation. Part 4 Offshore design, construction, O&M: Offshore loads and wind turbine design; Support structures for offshore systems; Integrated wind farm planning and design; O&M of offshore systems. Large-scale wind power generation is one of the fastest developing sources of renewable energy and already makes a substantial contribution to power grids in many countries worldwide. With technology maturing, the challenge is now to increase penetration, and optimise the design, construction and performance of wind energy systems. Fundamental issues of safety and reliability are paramount in this drive to increase capacity and efficiency. 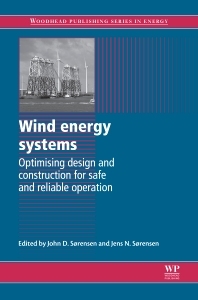 Wind energy systems: Optimising design and construction for safe and reliable operation provides a comprehensive review of the latest developments in the design, construction and operation of large-scale wind energy systems, including in offshore and other problematic environments. Part one provides detailed coverage of wind resource assessment and siting methods relevant to wind turbine and wind farm planning, as well as aeroelastics, aerodynamics, and fatigue loading that affect the safety and reliability of wind energy systems. This coverage is extended in part two, where the design and development of individual components is considered in depth, from wind turbine rotors to drive train and control systems, and on to tower design and construction. Part three explores operation and maintenance issues, such as reliability and maintainability strategies and condition monitoring systems, before discussing performance assessment and optimisation routes for wind energy systems in low wind speed environments and cold climates. Part four reviews offshore wind energy systems development, from the impact of environmental loads such as wind, waves and ice, to site specific construction and integrated wind farm planning, and of course the critical issues and strategies for offshore operation and maintenance. With its distinguished editors and international teams of contributors, Wind energy systems is a standard reference for wind power engineers, technicians and manufacturers, as well as researchers and academics involved in this expanding field. Professor John Dalsgaard Sørensen is Head of Wind Energy Systems and Technologies (WEST) at Aalborg University (AAU), Denmark, and is noted for his research on wind energy structures and wind turbines. Professor Jens Nørkær Sørensen is Head of Fluid Mechanics at the Department of Mechanical Engineering, Technical University of Denmark (DTU), and is noted for his research in fluid dynamics and the aerodynamics and aero-acoustics of wind turbines.